A succession of coincidences led to the organization of this Retreat. In mid-June, I was introduced to Yogiraj Mangeshda through a friend – Deepa, who told me of a certain Guru visiting Toronto for 5 days and would be speaking at a temple on the fourth day of his visit. Since he was a teacher of Kriya Yoga, I was intrigued as I had read Autobiography of a Yogi over 20 years ago and since then have always felt Babaji’s presence in all the entrepreneurial ventures in my life – almost feels like the Big Orchestrator behind the scenes. I never question it, just acknowledge the Presence and keep making magic. We heard that on the fifth day, which was a Sunday, he was going sightseeing to Center Island. Since Deepa and I live at the Harbourfront, we asked if we could come along for the walk. Yes, of course. We asked where they were going to eat lunch and since nothing was arranged, I invited them for lunch to my home. The next day they arrived around 12:30pm and being lunch time already, we decided to have our lunch before sightseeing. I showed him the Multicultural calendars that I have been publishing for the past 20 years and spoke to him about the 54 acres of mainly forest I purchased last year in Sunderland to create a retreat. Incidentally, “Sunder” in Hindi means “beautiful”. And this is what I am aiming to do – create a garden of Eden with six yurts, raised vegetable garden for organic food, flowers and fruit trees that attract butterflies and hummingbirds, and a serene, rustic place of rest and restoration. It will be a yurt for all reasons. I told him that on his next visit, I would hijack him and take him to the retreat. He replied “Well, I am being told to go there now!” An hour and a half later, I was showing him the 5-bedroom log house and the forest area at the back where the yurts would be setup shortly. Mangesda was very pleased with the project and took great interest in the gardening aspect of the retreat especially in acquiring wild flowers for his ashram in India. He asked when would be good time to do a Kriya initiation at the retreat and I suggested end of August before the calendar marketing begins. He mentally calculated where he would be at that time, said he would make the necessary changes to his schedule (since he travels extensively), and said “Yes, I will give diksha to people who wanted to attend the one-day retreat. Just like that!! I couldn’t believe my ears. If there was any kind of initiation to open the Yurt-Retreat, it would have been Kriya Yoga and I consider it such an honour. Just before we left the retreat, Dada asked to see my hand. I stretched out my right hand. He turned my palm towards the ground, and with one of his fingers, quickly rubbed the top of my hand. The beautiful scent of sandalwood emanated from my hand and stayed till the end of the day! Mahavatar Babaji means “Divine Incarnation” is both ageless and eternally young. Sometimes he is formless, while at other times, he appears before his disciples in any form he wishes to liberate humanity from its worldly fetters. This Himalayan yogi is said to incarnate himself each time that it is necessary to relight the Kriya Yoga flame. His works are divine, shrouded in a mystery that eludes precise detail. Time has failed to reveal the facts about his birth, identity, and life. He is primordial, mahakal, and immortal, not remaining captive to the bounds of time and space. Babaji remains engrossed in deep meditation in the dense forests, caves, and snow-covered peaks of the Himalayas, at the same time keeping a watchful gaze on earnest seekers on their paths to the Ultimate. 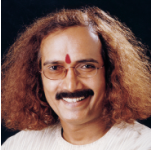 His miraculous appearance and disappearance, as narrated by his disciples Lahiri Mahasaya, Swami Shriyukteshwar, Paramahamsa Yogananda, Mageshda and few others is his unique way of guiding disciples on the path of divinity toward rapid liberation. He appeared before Paramahamsa Yogananda before Yoganandaji’s voyage to the West. The full account is written in his book “Autobiography of a Yogi”. The story of Lahiri Mahasaya’s meeting with Babaji in 1861 in the Himalayas is related in Paramahansa Yogananda’s book, Autobiography of a Yogi. Lahiri Mahasaya was a layman, father of a family, but also had obtained the highest realization by the means of Kriya Yoga. He soon became famous and many desciples came to him. He taught Kriya Yoga to monks as well as to householders. He has been called a Yogavatar, “an incarnation of Yoga”. Among Lahiri Mahasaya’s best desciples was Shri Yukteswar who was also a married man. Later he took orders and was known as Swami Yukteswar Giri. Shri Yukteswar was also a great astrologer, and created a form of astrology which he called Cosmic Astrology. This system establishes the relation between the planets, the stationary stars, the signs of the zodiac and the energy centres (chakras) situated in the human body. This astrology is therefore in direct relationship with the practice of Kriya Yoga. Shri Yukteswar had numerous bright disciples, among whom were Swami Narayana Giri and Paramahansa Yogananda. Paramahansa literally means “supreme swan (soul)”, and this title was bestowed on Yogananda by Swami Shri Yukteswar in 1935. Paramahansa Yogananda, author of “Autobiography of a Yogi”, was one of the first Indian yogis to come to the West. Residing in the United States until his mahasamadhi (a yogi’s final conscious exit from the body) in 1952, he had an important part in spreading Kriya Yoga around the world.